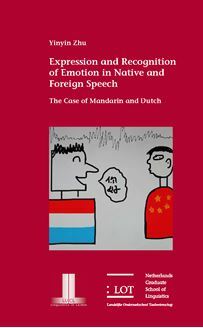 Yinyin Zhu Expression and recognition of emotion in native and foreign speech The case of Mandarin and Dutch This study investigates the perception and production of emotional prosody by native and non - native listeners and speakers , i.e . Chinese and Dutch listeners and speakers , including Dutch L2 learners of Chinese . The acoustic analysis in this dissertation shows differences between three types of production of emotional prosody , i.e . Chinese L1 , Dutch L2 and Dutch L1 . This study also studies an in - group advantage and a cross - cultural perceptual ability of recognizing emotional prosody in an unknown language . Furthermore , a functional view is tested in this study predicting that listeners of a tonal language ( such as Mandarin Chinese ) will be less intent on and less proficient in the paralinguistic use of prosody than listeners of a non - tonal language ( such as Dutch ) . This dissertation describes three judgment studies in total . The first two were carried out with native and non - native speakers and listeners of Chinese , and using Chinese native speakers and listeners to provide a baseline . The third study was conducted to test how well novice Chinese and Dutch listeners recognize emotional prosody expressed in their native language and in the other language . The results show that Dutch L2 speakers of Chinese are not able to produce emotional prosody as well as Chinese native speakers do ; neither are they able to vocally express emotion as recognizably as they do in their L1 . It seems that Dutch L2 speakers of Chinese develop a hybrid system for expressing emotional prosody in the L2 . Moreover , the functional view is supported , indicating that Dutch listeners are generally better than Chinese listeners in recognizing emotional prosody , regardless the language in which the emotion is expressed . This dissertation is of interest to linguists , psychologists , phoneticians , language instructors or coaches , and those who work in the perception and / or production of emotion cross - culturally .